Preventative health is a behavioral problem. 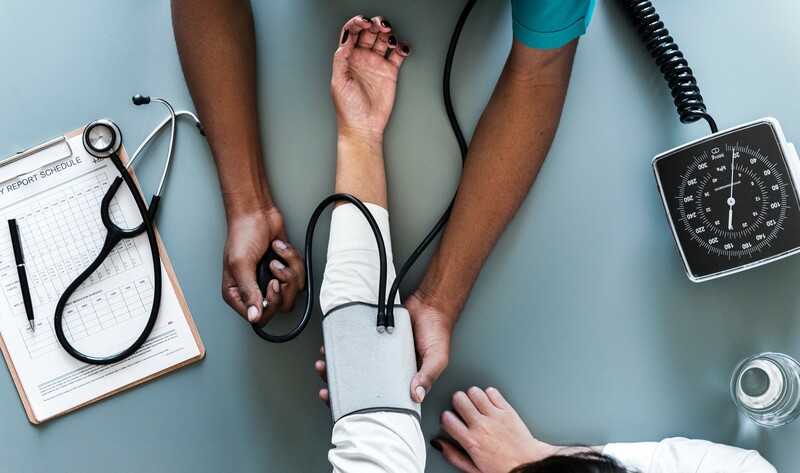 While we can rationally know that we must take our medication / exercise / ensure we are protected through vaccines, it is another thing entirely to follow-through with our intentions and take the necessary measures against diseases — especially those which are preventable and curable. This is all the more important in a developing context, where healthcare is not a standard and commonplace support. Yet, vaccination is one of the most cost-effective ways of avoiding disease — it currently prevents 2–3 million deaths a year, and a further 1.5 million could be avoided if global coverage of vaccinations improved. Indeed, the WHO identified vaccine hesitancy (the reluctance or refusal to vaccinate despite the availability of vaccines) as one of the Ten threats to global health in 2019. While more children are being immunized than ever before, in 2019 an estimated 19.5 million children under the age of one still did not receive DTP3 (Diphtheria — Tetanus — Pertussis) vaccination, one which protects against infectious diseases which cause illness or disability. How can Behavioral Science help? Luckily, there is an existing body of work on the applications of Behavioral Science to aid preventative health in a developing context. Research conducted in Malawi found that along with partner-delivered self-test kits, fixed financial incentives encouraged attendance of post-test HIV services amongst men in urban Blantyre region. Similarly, research on increasing immunization rates in India found that offering lentils for each visit to the health camp significantly increases immunization rates. These studies help us to understand how nudges and micro-incentives can help people to improve their behavior and subsequently, their health. However, given the different format of the incentives in these two studies, we were curious as to how the magnitude and medium of the micro-incentive might influence the impact of the intervention. We decided to run a quick “Off the Record” study to help us better understand the context of incentives. These light, quick studies enable us to approach the research design process informed, thanks to real data collected from our lab. This is usually a stepping stone to a potential larger study, where we can apply our rigorous methodology to test all the factors which influence behaviour, weighing and comparing their value against the other. How does the magnitude and medium of a micro-incentive affect attendance for an information session on vaccinations? To explore this question further, we set up two mini-studies; in the first one, we tested the effect of magnitude of cash incentives on session attendance, and in the second, we tested out the medium of various micro-incentives (by testing various unique items that are of equal monetary value) and their effect on session attendance and final incentive choice. During the session, respondents in attendance, irrespective of the treatment groups were given a talk by a registered nurse focusing on the important vaccines given to infants from birth up to the age of 18 months. The nurse took them through the vaccines and immunization schedule as required by the Kenyan law. In addition, the nurses covered how to handle minor events following immunization so as to encourage mothers to go for the vaccines. In looking at the results of the second design, we find that the non-cash incentives strictly dominated the cash equivalent. This may suggest that the cash incentive crowds out the intrinsic motivation of the individuals to attend the session, similar to this research suggesting that payment for blood donation can reduce participation rates. 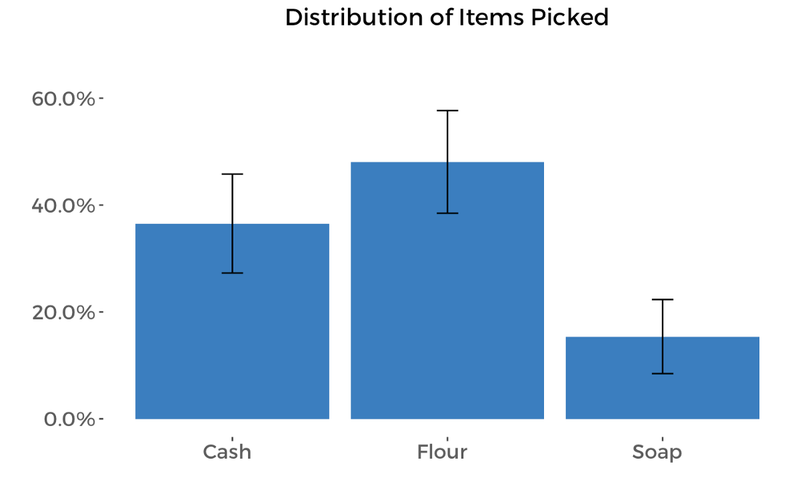 Looking even further at the non-cash items, we find that flour was both preferred by customers (measured in an exit survey), and more effective at promoting incentives. This ran counter to our thinking that domain relevance may matter (i.e. dettol and vaccinations might plausibly fall in the same mental model of health planning). 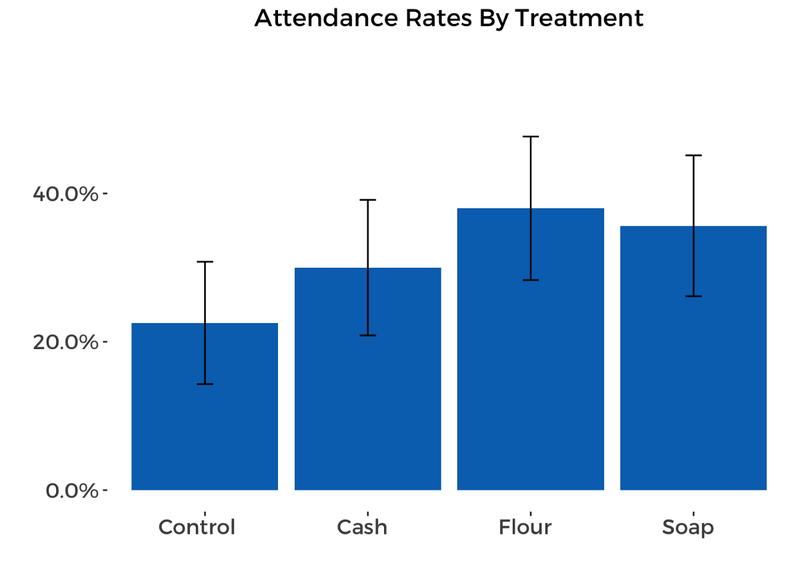 If we compared attendance rates in the first study, we find suggestive evidence that cash incentives do increase attendance, but only once the stakes are high enough. However, upon further analysis, any treatment effect seems to be driven by education of the participant — tertiary educated women were most likely to attend the information session, and when you control for that it overrides the high cash individual treatment effect. This suggests that on the whole, the magnitude may matter, but the effects are likely weak given that the effect doesn’t hold when you control for key demographics. In a separate survey of 50 women from the same demographic and geography, we find that participants can predict the relative effects of offering the non-financial incentives on attendance as well as correctly estimate the overall preferences. This further supports the belief that participants should be more heavily involved in intervention design. We would like to explore this with a larger sample as well as cross-sampling by measuring whether those usually at the forefront of design (such as university students and development researchers) can estimate the effects correctly for different populations (i.e. can university students predict what would increase attendance by women from similar informal settlements and can development researchers correctly estimate which treatment would have the most effect). Our forecasting attempts so far have excluded men, however, whilst thinking of what interventions might work best, it would be interesting to also run some forecasting exercises with males from the same populations. As an extension of our finding on the perception of bundling incentives by domain (namely, that it is effective in increasing attendance but is not the preferred choice), further studies could focus on different types of domain bundling such child development related, personal items, health care vouchers, other household goods, etc. Finally, follow-up surveys with participants who didn’t attend the session after signing up would help us to qualitatively understand the incentive effects. Our goal is to make research accessible in order to start, continue or inform conversations that help us better understand human behavior. With this in mind, each “Off The Record” post will provide access to the full findings from our studies, freely available here. As a commitment to Open Science, we’ll continue to keep this anonymized data live at this page for all our on-going research efforts. This blog post is part of our larger “Off The Record” initiative where we share findings from small-scale research projects, designed to collect initial data and kick-start a conversation. If you would like to learn more about a specific human behavior or have a research idea you think we could explore for a future “Off The Record”, please reach out to us on Twitter or via email.